Delta Force Paintball Birmingham: 10 AwesomeGame Zones Available! Looking for a fun activity to do with your friends in the Midlands? Then take a trip to Delta Force Paintball Birmingham, the largest paintball centre in the area. Offering customers an awesome selection of 10 movie quality game zones, complete with state-of-the-art props! Paintballing with Delta Force has never been so good. Found just off junction 4 on the M42 motorway, Delta Force Paintball Birmingham centre lies within 64 acres of lush woodland; it makes a gorgeous backdrop to your game of paintball. 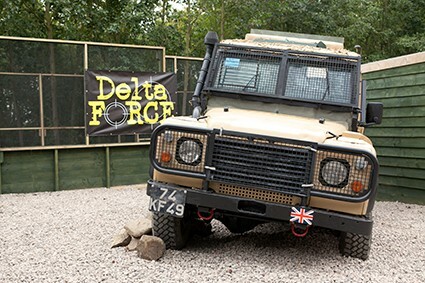 You’ll be able to dart about in the great outdoors, hide behind trees and fire paintballs at your friends – a day spent with Delta Force will leave you feeling elated! The paintball game zones at the Birmingham Paintball Centre include: London Apocalypse (which features several original double-decker buses for players to hide in), Pablo Escobar’s Air Strip (which involves having to capture an evil drug lord), Mad Murphy’s Jungle Attack (where players need to try and rescue an injured allied airman from somewhere deep inside the tropical rainforest), A Bridge Too Far (home to several wooden bridges for players to charge across), Afghan Fort (featuring a large two-storey fortress with sniper tower), Tomb Raider (where a huge stone pyramid surrounded by tunnels and statues lie), The Haunted Graveyard (set in a creepy graveyard with an old church and lots of eerie-looking tombstones and coffins), Viet Cong Village (set in a seemingly abandoned Vietnamese village) and Chemical Alley (a fast and furious game of speedball, using attack and defend tactics). With such a wide variety of thrilling game zones to enjoy, customers at Delta Force Paintball Birmingham are completely spoilt for choice! Our fantastic paintball centre also benefits from top quality facilities at its basecamp, including: fully flushing WCs on mains water, open and covered picnic areas with lots of seating, and secure lockers for guests to store their valuables (for a small charge). Customers can also opt for a hot pizza lunch (delivered by a local offsite catering company) – just order in advance when you make your booking, or on the morning of your event (before 11am).